Cat Sticks are a complementary pet food for cats. The treat your cat will love.Perfect to feed at any time as a tasty, chewable snack or treat. 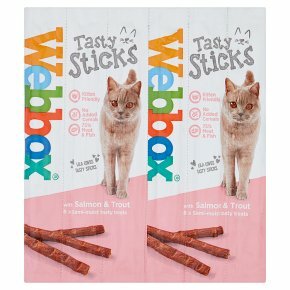 Gently cooked to produce a delicious, moist, meaty treat, your cat will adore Webbox® Cats Delight? cat sticks! Each treat stick is individually wrapped for freshness - to open, simply tear open from the top of the pack.